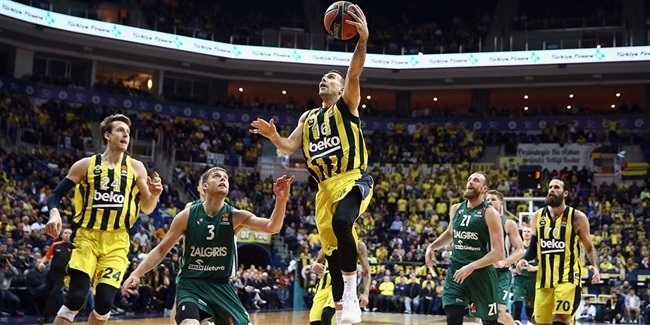 The Turkish Airlines EuroLeague has had several hard-to-beat records. Since the late Alphonso Ford scored 41 points for Peristeri in a playoffs game in 2001, no one has bettered him, although three other players – Carlton Myers, Kaspars Kambala and Bobby Brown – were able to match that total. When it comes to performance index rating, the calculation that is used to determine the MVP of each round, the EuroLeague's single-game record has been unbreakable for 15 years. No one has ever got close to what Tanoka Beard did for Zalgiris in a game against Skipper Bologna on January 22, 2004 – a PIR of 63! Back in that 2003-04 season, Zalgiris was led by the legendary Arvydas Sabonis, who earned that season's full-season MVP honor at age 39. Sabonis averaged 16.7 points, 10.7 rebounds and a PIR of 26.3 that season. Sabonis, however, did not play in two of his team's 20 games – against Montepaschi Siena at home and against Skipper on the road. With Zalgiris's franchise player out of action, it was the perfect moment for Beard to step up. On January 22, 2004, in Bologna, Italy, Beard started the game strong, scoring 9 points in the first quarter to get Zalgiris within 27-23 of the hosts. He reached halftime with 17 points and kept pacing Zalgiris throughout the entire game. When the dust settled, Skipper had won a high-scoring game, 117-107 without overtime, and Beard had a monster stat line: 35 points on 11-of-14 two-point and 13-of-13 free throw shooting, 19 rebounds – 10 of them on the offensive end – 2 steals, 2 blocks and 11 fouls drawn for a PIR of 63. The previous record belonged to Jaka Lakovic of Krka Novo Mesto, who had a PIR of 55 against Real Madrid on October 18, 2001. "I mostly remember that big Sabas was injured and we needed a victory to stay in a strong position to advance," Beard recalled to Eurohoops.net this week. "Honestly I haven't thought much about that record, but it's nice to be reminded of it. Like any other record, it will be broken. A player would just need to focus on the bigger picture and give everything they have for their team and it will happen." "I haven't thought much about that record, but it's nice to be reminded of it." Current Zalgiris captain Paulius Jankunas also played in that game. Jankunas has played in more than 300 EuroLeague games, but that one was just his 10th in the competition. Still, he remembers a lot of things about it. "Even after 15 years, I remember that game. We played on the road in Italy and it was a high-scoring game. From the early minutes we saw that Tanoka had it going and that it might be his night. If I remember right, he started the game really aggressively and kept his mojo throughout all the game. It was really impressive numbers: points, rebounds and PIR – amazing numbers," Jankunas said. "I don't think it was the plan. But he started good. It was obviously his night and our coaches adjusted the game plan for him to have the ball even more." Despite playing alongside Sabonis, who produced soaring numbers, Beard finished that season with solid averages of 14.6 points and 7.6 rebounds for a PIR of 17.4. As for the 2003-04 season, Beard and Zalgiris had the bitterest outcome possible. 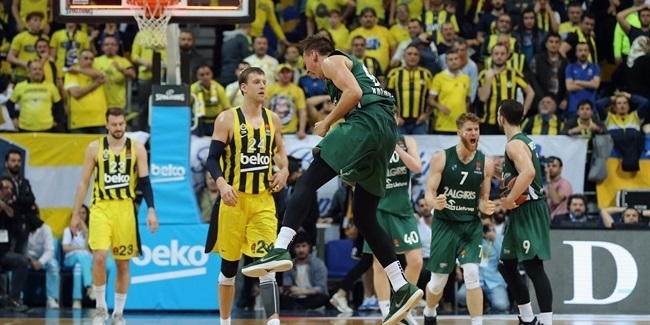 In a do-or-die game against Maccabi Elite Tel Aviv to make it to the Final Four, Zalgiris led 91-94 with 2 seconds left and Maccabi sent Giedrius Gustas to the foul line. Gustas had hit 18 of 19 free throws that season, but this time missed both of his attempts. Beard entered the zone before Gustas's second attempt hit the rim, stopping the clock with 2.0 seconds left and allowing Maccabi to inbound the ball. Gur Shelef threw a pass the length of the court and Derrick Sharp tied the game with an impossible three-point shot, sending the game to overtime, where Maccabi won 107-99, advancing to the Final Four in Tel Aviv instead of Zalgiris. Maccabi went on to win the first of its back-to-back EuroLeague titles by beating Skipper in record-setting fashion in the 2004 championship game. Beard's monster game against Skipper is still in the record books. No one has come close to his achievement. The highest PIR registered after that game is 55 by Dejan Milojevic of Partizan Belgrade, during the next season, but in the same year, on December 2, 2004. In the last decade, the only player to record a PIR of 50 was Brown of Montepaschi Siena, the day he scored 41 points against Fenerbahce Istanbul, on January 4, 2013. Beard is the third-best rebounder in EuroLeague history (9.1 rpg. ), only trailing Joseph Blair (10.1 rpg.) and Mirsad Turkcan (10.0 rpg.). He also ranks eighth in PIR per game (18.5), in a list led by Anthony Parker (21.4 PIR) of the Maccabi teams that won the title in 2004 and 2005. Beard finished his EuroLeague career with 1,107 points and 663 boards in 73 games, all of them with Zalgiris. Beard remembers fondly his days in the competition and his years in Lithuania. "More than anything I miss the competition and the camaraderie of my teammates. We were a pretty close group for the most part, and had our eyes on the ultimate goal. We just weren't built top to bottom for the journey ahead of us at that time," he said. "I love to watch Zalgiris and Brandon Davies because I see so much of myself in him." Back at home in the United States, Beard keeps an eye on the EuroLeague and on his old team. "I will watch games from time to time," he said. "Obviously, I love to watch Zalgiris and Brandon Davies because I see so much of myself in him, and it is fun to see his success at that level." Although he's far away, his fans in Europe should not be surprised if the author of the EuroLeague's greatest game ever is seen on this side of the Atlantic again. "I am still involved in basketball today by helping develop young players with individual skill work and coaching a high school team in my city," Beard said. "I am thinking about coaching at the professional level internationally at some point, so I look forward to the next stage." As for the question of whether Tanoka's record can be broken, Jankunas thinks so, but not in the near future. 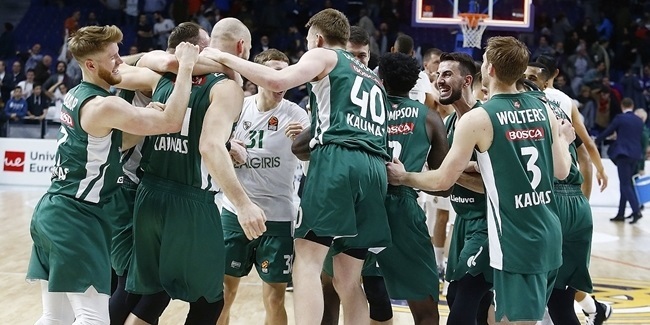 "The records are meant to be broken, but the basketball is a bit different now," the Zalgiris captain said. "You barely see anybody getting even over 40 PIR, while 30, 34 or 38 is usually enough to become MVP of the Round these days. Of course, there will come that day when somebody will have a tremendous evening and will play the game of the century, but who knows when it will happen."